Isa Maxwell’s second adventure proves to be even more entertaining than the first and decidedly more dangerous. This time, the dippy but well-intentioned blonde, having made oodles of money from writing a book, embarks on a trip to India to use some of her wealth to help the poor and dispossessed, plus a supposedly down-on-his-luck prince. Isa’s arrival in Delhi is a total culture shock. Noise, fumes, chaos, locals haggling for business, police corruption, Indian mafia activities, you name it, Isa finds it, or it finds her. It’s as if her naïvety, combined with good-heartedness, acts as a magnet to those looking for easy pickings. But to underestimate Isa’s ability to pull out all the stops (albeit with plentiful blunders on the way), is to assume that she isn’t capable of great ingenuity when it comes to survival. 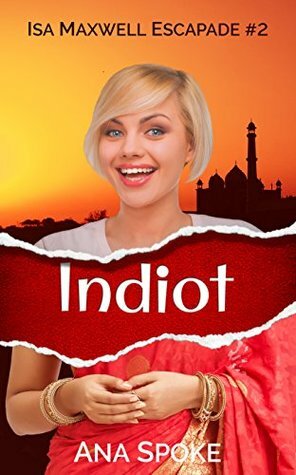 Shizzle, Inc (Isa Maxwell Escapades Book 1) was primarily comedy chic-lit, but Indiot is a thriller with OTT elements that amount to comedy of the variety that makes you cover your face or clutch your head as you wonder if things can get any worse for Isa. It would make a great comedy thriller movie, and the fact that I kept seeing it as such, says a great deal about Ana Spoke’s ability to paint an extremely vivid picture of India as seen very much through her central protagonist’s eyes: the idealistic outsider learning the hard way about an alien culture. Ana Spoke gave me an advance copy of Indiot in exchange for an honest review, although my apologies to the author for not making it until nearly a week after publication day. I actually read the novel in two sittings, which says much about its ability to grip the reader’s attention.The only negative to me–and it’s only something small–was that I felt that there could be a little more about Isa’s relationship with Mr Hue and with her friend Harden in Book 1. This was necessary both as a recap for those who read the previous novel soon after it came out (about 9 months ago), as well as to anyone who picked up Book 2 first and read it as a standalone. So, everybody, read both novels, and read them in the right order. And when you reach the end of Indiot, I can pretty much guarantee that Ana Spoke will have left you dying to read Isa Maxwell’s Escapade Book 3. If you missed reading Shizzle, Inc, you can now download it for free on Kindle (Amazon US & Amazon UK). Excellent review. I thoroughly enjoyed Shizzle Inc as well and it does sound like Isa’s escapades have only gotten more entertaining. Those escapades of hers certainly have. If you enjoyed Shizzle, then you’ll love Indiot. Excellent review, I want to read the books! Yes, do read the books. You won’t be disappointed. Isa Maxwell is definitely a memorable character! I don’t usually read humor but am glad I discovered Ana Spoke’s writing after she linked up with me in Blogland. So do I, and it’s really apt!